In my past life, I was probably Italian. I mean, even my first name comes from the land of the boot. But the biggest giveaway is definitely how much I love Italian food. Nothing nourishes me like a rich bowl of pasta. Nothing is craved more than a well-made pizza. We are blessed to have so many fabulous Italian eateries in Melbourne, that it can sometimes be hard to choose. Zia Teresa (Auntie Teresa), is Teresa Bruno, who opened this restaurant with her husband in 1985. The couple wanted to focus on authentic Italian food. “Soon we acquired an excellent reputation and grew to become very popular. Our home made pasta and completely new dishes people had never tasted before were our specialty.” Says Teresa. The restaurant has kept its essence. Despite its modern and trendy Instagram feed, Zia Teresa (the restaurant) looks slightly old-world and romantic. Entering at the corner room, your first impression may be of the dim lighting, or the lively chatter. The waiters are professional, but overall it is about the food. The food is unpretentious, authentic and flavoursome. There are several vegetarian options and specials daily. 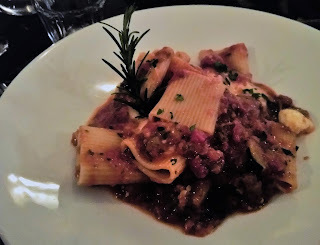 The eggplant paccheri is the best past I have had in a long time. The pasta is fresh and al dente. The eggplant is so soft but flavoursome. The tomato sugo is intense, bringing a richness to the dish. It is served with buffalo mozzarella and basil. This dish can also be made vegan. The bruschetta is also vegetarian, with a selection of tomato, eggplant, capsicum and mushroom. Each is served on dense country-style bread. We also enjoy the Mediterranean salad with goats’ cheese, tomatoes, olives and mixed leaves. “I wake up every morning with new ideas and new tasty dishes in mind. (…) The happier our customers are the more creative I become with my cooking." Says Teresa. There is a reason why this Brunswick East eatery is still thriving.